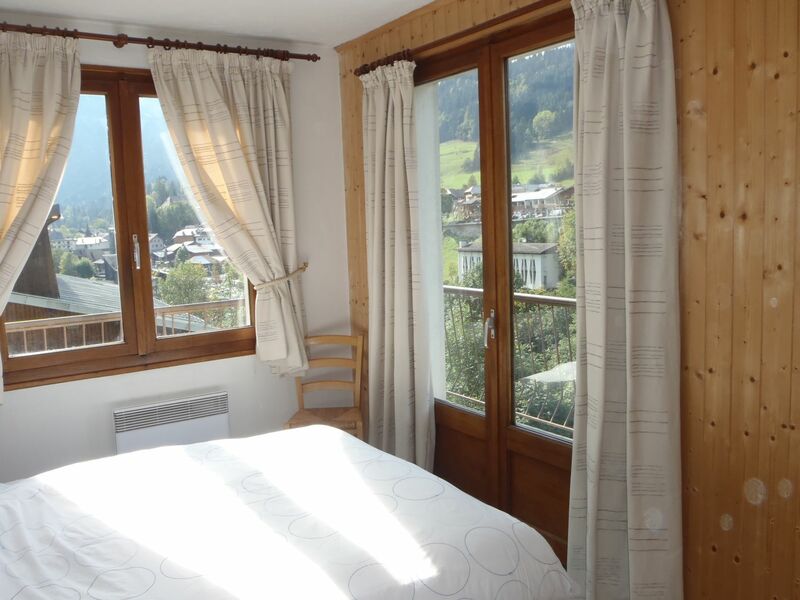 Le Pigeonnier Apartment - Excellent Summer accommodation at affordable rates! The apartment has a separate fitted kitchen (with all the usual mod cons), and a lounge / dining room opposite. The dining table seats 8, and there are 2 sofas, a TV (with Freesat TV) and a DVD player, free Wifi, and double doors out onto a balcony which runs around 2 sides of the apartment. There is a fireplace but it is purely decorative. Leading off the lounge is a bright double bedroom with the same amazing view! Next to the kitchen is one modern shower room / WC, and at the end of the corridor is a utility room with washing machine, plus a second shower room and WC. There is a large quad bedroom (double bed plus full size bunk beds) and a small bedroom with full-size bunk beds. Bikes can be stored in the private secure garage at road level. There is parking for 1 car right next to the building. The address is 349 Route des Bois Venants, 74110 Morzine, at [46.182720, 6.706786] map Ref on Google maps.